wonder where smith is, is he injured or dropped? Smith was listed as 'questionable' due to a knee problem before the match. Good chance for Wynne who I don't think would be starting if Smith was fit. Rapids had a poor disciplinary record in 2018. Seems lessons not learnt for 2019. Wynne CB partner Solberg gets a straight red at 27 mins. Colorado 1-0 up at that stage. Valeri scores for Portland soon after. Hudson subs off a striker (Rubio) and brings on a new CB (Danny Wilson) to partner Wynne. Portland's other Argie Blanco scores, and they are up 2-1 at HT. 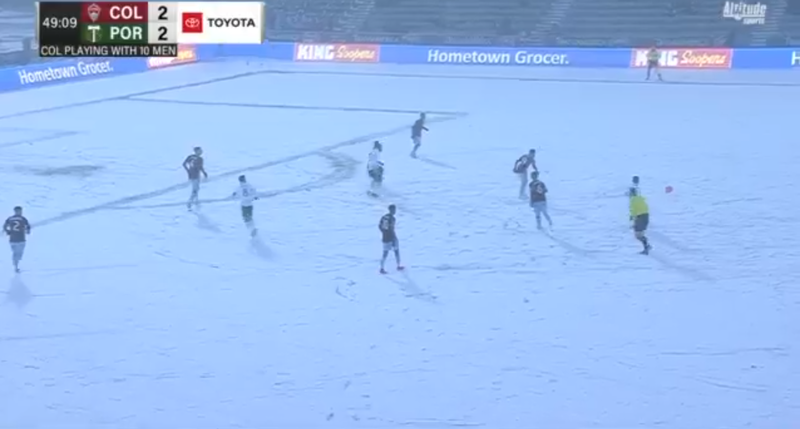 The snow is awesome, pitch was green at the start. Reminds me of that world cup qualifier USA v Costa Rica.Also at the DSGP. Gloves all round. Game must have been close to being called off surely. Makes a bit of wind & rain at the ROF seem balmy. Already down 1-0 too. Long way to go of course but Colorado will need some results in the early part of this season if Hudson is going to keep his job. Looks like the defensive frailties have rolled over from last season too. Finishes 2-0. Wynne 90 mins. Wynne keeps his starting CB role against Sporting KC, as Tommy Smith comes onto the bench. Rapids lose this game and pressure will be on Huddo. Full 90 mins for Wynne in a 1-1 draw. Sporting KC scored at 88 mins. From memory conceding late was a problem for Rapids last season. Smith stays on the bench. With Smith suspended, Wynne starting at centre-back vs Orlando City. Colorado Rapids down 2-1 at half-time. Completely at fault for Orlando's second goal. Miskicked the ball in the middle of the box then charged out of position leaving an easy goal for Orlando. Earlier on he hit the crossbar... of his own goal. Though it was actually a goal saver as if he didn't intercept the cross ball Orlando would've had a tap in. One of those ones that you often see an oggie from, but he got under it just enough. Rapids actually managed to go 3-2 up, but Orlando scored at 81 & 89 mins (pen) to pinch it. Exciting game. Nani with first & last (pen) goals for OC. Serna (no 17) got hauled by Hudson at HT, and then his replacement Solberg (no 44) seems to be partly at fault at least, for both Orlando's last 2 goals.